So what’s in store for the little bike rippers for next year? Not much, unfortunately. However, what is coming down the pipe looks promising, and may signal a bit of a wake-up by the industry to the fact that there’s a whole generation of mountain bike rippers coming up and they need the gear to shred with! We first spotted this little gem at the Crankworx Expo where it seemed to be getting as much or even more attention than any of the other bikes, with kids throwing their legs over it and parents looking closely to see if it’d be appropriate for them. The Fluid 4.3 is the 24″ wheel version of the popular Fluid platform, and offers a spec worthy of any full-sized adult bike. It uses a 26″ fork and what looks like the rear triangle from the 26″ version so there’s a possibility that the bike might be upgradeable in size with a wheel swap (though don’t quote us on that, more info when it’s available). Speaking of modifications, Norco markets this as an all around trail bike but judging by the posted geometry numbers on their website, the bike could be made a little more aggressive by swapping out a longer fork. Good news for the park & shuttle rats. What stands out most about this bike is the price. 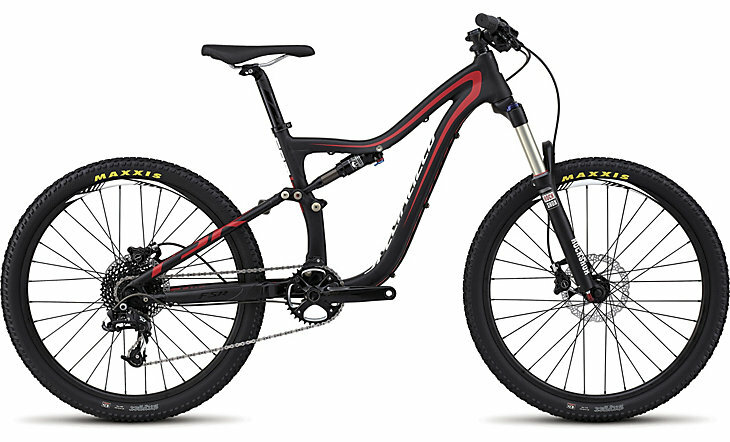 $1720CDN ($1488USD) for a capable full suspension bike with a respectable parts spec. This brings it in at about half of what a Little Shredder Phenom goes for (albiet with lesser parts), and a few hundred less than the Kona Stinky 24 with comparable parts. 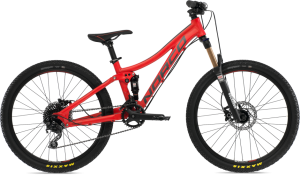 You can check out the 2015 Fluid 4.3 on the Norco website. 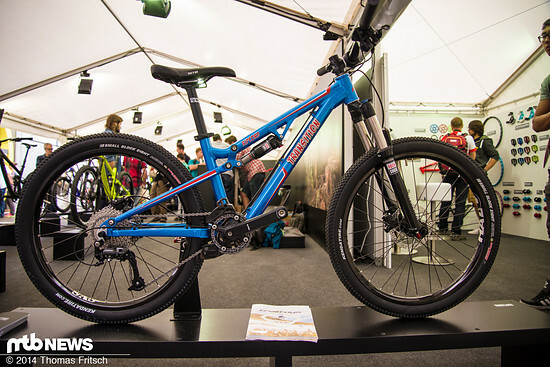 Transition has always been pretty close to the cutting edge with trends in mountain biking. They were the first to come out with a heavy duty freeride oriented low travel trail bike in the ‘Preston’ (a category that is now pretty much known as Enduro), they were one of the first to realize that bigger wasn’t necesarrily better when it came to travel in freeride bikes when creating the very popular ‘Bottle Rocket’, they pretty much pioneered suspension DJ frames when they released the ‘Double’, and now they’re hoping to get ahead of the grom trend with their new ‘Ripcord’. The Transition Ripcord is a 24″ freeride bike that should help your little ripper step up his or her game. It should fit slightly larger than the Fluid, but it’s angles are much better suited to jumps, downhill, and park riding that groms seem to gravitate to. Specs aren’t set, but expect it to include a very worthy kit with hydraulic brakes, Race Face cockpit, and a decent wheelset. Speaking of great deals, the Ripcord is expected to be priced at $1499USD. While the 24″ Specialized Grom Hit fades into memory (and soars in price on Craigslist), Specialized has taken an approach like Norco and focussed a little more on the Trail Enduro side of things with the release of their Camber Grom model. The Camber Grom is spec’d with similar grade components as the other two bikes we’ve mentioned but it’s by far the largest of the three, with significantly longer reach, Top Top and Seat Tube. Combine that with a lightly steeper head angle, and you’ve got a bike that’s much more designed for attacking singletrack climbs as opposed to jumps, shuttles, or bike parks when compared to the Fluid or Ripcord. On HUGE advantage to the Camber Grom is that it’s designed so that when the rider outgrows it, you can just thrown on a set of 26″ wheels and get another couple of seasons out of the frame and all it’s parts. The Specialized Camber Grom is expected to retail at $2200USD, which is the most expensive on this list, makes a lot of sense when you consider how long it can be used with a simple wheel swap. More info on the Camber Grom can be found at Specialized.com. Sadly, nothing else to report. Looks like Sombrio may have discontinued it’s Grom line as part of it’s restructuring/purchase, and the usual suspects are pretty much doing the same thing in 2015 as they did in 2015 when it comes to smaller FS bikes (Kona, Lil’Shredder, Commencal). While it’s nice to see a couple other manufacturers jump on the Grom train, it’d be even better to see something from the two biggest players in the sector (Trek & Giant), that would get the market going and we’d see much greater competition in the sector. Ahhhh well, we can dream can’t we?